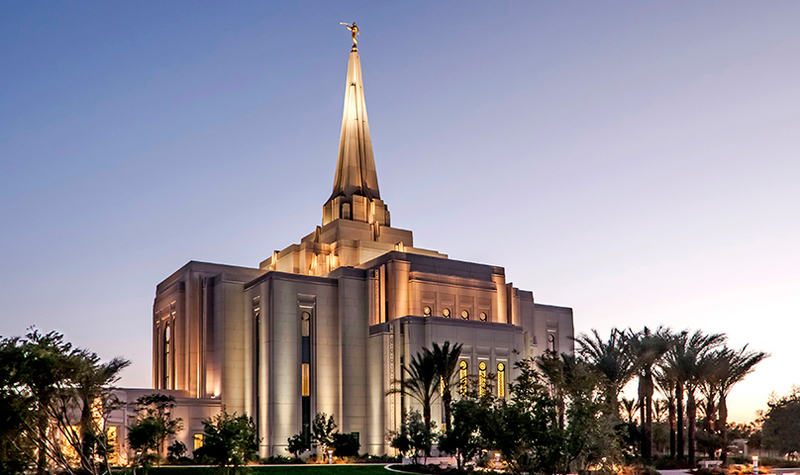 Until February 15th, the newly constructed Mormon temple in Gilbert, Arizona, USA will be giving inside tours to the public. This is noteworthy because, once the building is dedicated only those members of the church who are in good standing can enter. Inside (and only inside) we wear distinctive clothing that symbolizes our relationship with God and our duty as His children. We treat this apparel with great respect and keep it private because of its sacred nature. In case you're wondering, I'll be making my point soon. Last week I went with my family and some friends (not Mormon) to tour the interior. It was a very peaceful experience, but coming out of the parking lot, my wife and I noticed a man on the corner of the busy intersection. He was wearing the distinctive white temple clothing over the top of shorts and a t-shirt, while holding a sign that read: THE DEVIL'S HOUSE. It was an unpleasant shock to say the least. My wife felt sick for a while afterward. It was disturbing to see something so special to us being made fun of. Now the point. What the man was doing was perfectly legal. He wasn't hurting anyone. But was what he was doing moral? Depends on who you ask. The man surely thought he was doing the public a service by warning them against the Mormons. To me and my wife, it felt very amoral, indeed. The vast majority of people, however, would probably not have an opinion one way or the other. Should the paparazzi harass celebrities the way they do? Is it morally right? Depends on what we're doing at the time. In movies, when a star is pestered by impolite cameramen, we think, "What a bunch of jerks. They shouldn't be allowed to do that." Meanwhile, on our coffee table, sits the latest issue of US Weekly. Trying to define morality is like trying to determine whether the metric system is more useful than feet and inches. Everyone has an opinion and each thinks theirs is right. Author and blogger Victoria Strauss (among others) has expressed concern that the Story Surgeon eBook Editing App may violate the moral rights of authors. She suggested that because my reasons for developing the app were moral in the first place (I wanted it to take the mature content out of books for my kids), that it was time I addressed the moral rights of the authors who's works this app would affect. Unfortunately, that's easier said than done. The very definition supplied by one of my detractors, illustrates how illusive the concept is. "The scope of a creator's moral rights is unclear, and differs with cultural conceptions of authorship and ownership..." The Moral Rights Basics page goes on to list what may be included in the author's moral rights, such as preventing her work from being altered without her permission. In other words, a three-year-old with a crayon may violate the author's moral rights. A mother changing Bilbo's gender for her daughter, may violate them as well. According to the Berne Convention (which was quoted to me with great enthusiasm in the comments section of Victoria's article) if an author feels any of these acts are "prejudicial to [her] honor or reputation" she can bring legal action to the perpetrators. In Europe at least, they can apparently prevent a ten-year-old girl from putting stickers over the bad words before she lends the book to her friend. The one who tauted the Convention's ideals made it sound like Europe was on the cutting edge and it was only a matter of time before the US recognized how important it was to legislate the enforcement of an author's moral rights. The US is very familiar with the Berne Convention. (It's been around since 1886.) The reason they don't enforce it is the same reason the don't send the police to arrest the man with the DEVIL'S HOUSE sign. It's the same reason they allow the US flag to be burned in public. We may not agree with it. We may think it's in poor taste. It may infuriate us. (It does me.) But to a mother who lost a son in Vietnam, it may be the most moral thing she knows. So what does the Story Surgeon App have in common with a teacher skipping pages of a book as she runs out of class reading time? Everything. Yes, my app allows readers to make changes more easily, but they still do it. Through the act of searching, downloading, and applying the filters, they are making these changes to their own property. Will the authors feel that this is prejudicial to their honor and reputation? Maybe. But at least in the US, that's beside the point. Now in the first half of this blog post (that's right, it's only half over!) I've no doubt come across as an extremist, prone to hyperbole, with no sympathy for an author's feelings or rights. This is not accurate. I feel passionately about our rights as Americans, but I also feel passionately about writing. As an author of three (unpublished) novels I know how our works become like our children. We are protective of them. If I'm honest with myself, the idea of someone not appreciating my vision and possibly changing my words is disturbing. But just as I didn't yell out the window at the guy on the corner, I won't delude myself into thinking I can control how people receive my books. Almost done, I promise. There is one other reason I think The Story Surgeon App is All-American. As someone recently reminded me on Twitter, Thomas Jefferson was dissatisfied with some parts of the Bible. He didn't just move on to something else that interested him more (as some have suggested I do) he took the time to make changes to someone else's work because the book already meant so much to him. Although I don't agree with what he did in a religious sense, (and I certainly don't use the Jefferson Bible), I know exactly why he did what he did. And he had every right to do it. For that matter so does every religion that has their own distinct copy or "translation" of the Bible. If Moses and Paul could see all the changes that have been made to their history, they might feel their honor and reputation had been harmed. They certainly wouldn't be happy about it. But it is precisely because so many people copied the book and made it their own that is has become the single most widely read book in the world. (Of course I think the content also had something to do with that.) But the Bible was the original "living" book. The only difference is, if Story Surgeon had been available in the first century, in addition to having all the various versions of the Bible, each one of us would have the original, and Matthew, Mark, Luke, and John would be trillionaires. ".... I do understand that there are gray areas, and I think of fan fiction as existing in them. I know authors who love fan fiction based on their characters. I know authors who have formally attempted to stamp it out. I'm just sort of [shrug] about it.....As long as no body's making money from it that should be an author or creator's, I don't mind it. And I think it does a lot of good." "But I'd hope you'd see it as a privilege and not a right." Great authors have used their talents to inspire and teach the entire world. There are very few who can do (well) what they do. Despite my tough talk about entitlement and my own rights, I have a deep respect for artists and authors in particular. And I will comply with their wishes in regard to their works. If the Story Surgeon App is determined legal and becomes a reality, it will not allow users to make filters of books who's author has expressly denied their permission. Also, to prevent misuse and piracy, the app will not allow the user to save the filter any place but on the main sharing site, where illegal filters will be flagged and removed. Some people will be satisfied with this. Many won't. But until the world can decide on which version of the Bible to believe, I'll be making each book my own. Be it with a complicated app, or a Sharpie. Thanks http://www.workinghomeguide.com/13981/really-gizmodo-cheap-paparazzi-stunts-for-pageviews for the paparazzi pic. Thanks http://blogs.dallasobserver.com/unfairpark/2013/06/man_burns_flag_downtown_gets_a.php for the flag pic. I would suspect every publisher out there will stand in line to give you their author list to be place on the do not alter. Where exactly will the original ebook reside? Let's say I bought it and downloaded it to my kindle app on my phone. Will it stay on my phone? Where will the edits reside? On my computer or on your server? Will the entire edited version reside on your server or just the changes? Who will have rights to read the edited version? Terry, thanks for the comment. The original eBook will stay on the device. The changes will be saved in the app itself. (There will be no altered version, only the edits that can be viewed over the top of the original eBook.) Once you share the filter online anyone who owns that particular eBook can apply the filter.